Fiumicino Airport Shuttle provides transfers by private shuttle from Rome Fiumicino airport (FCO) to any destination and address requested, without any stop, in private vehicles, not shared with any other passenger. Our driver will wait for you at the arrival lounge of Fiumicino airport holding a sign with your name for a fast and easy recognition. Your pick-up time is automatically updated on our systems according to the actual landing of your flight. We can provide every kind of shuttle and taxi from Rome Fiumicino Airport in luxury cars, van, minibus and busses depending on your travel needs. 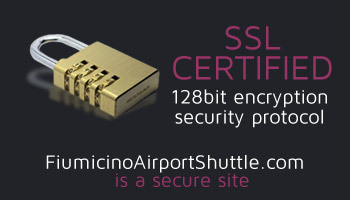 Booking your Rome airport transfers with Fiumicino Airport Shuttle is simple, quick and safe. Once you have completed the online booking procedure, we will send you the confirmation and the reservation number by e-mail. Furthermore, we will provide you with our local manager mobile number for any need. Meet and Greet at Rome Fiumicino airport is included in our service. Book your Rome airport shuttle with Fiumicino Airport Shuttle company! Save time and money!